Benito Amilcare Andrea Mussolini (July 29, 1883 – April 28, 1945) was the prime minister and dictator of Italy from 1922 until 1943, when he was overthrown from power. He established a repressive fascist regime that valued nationalism, militarism, and anti-communism combined with strict censorship and state propaganda. 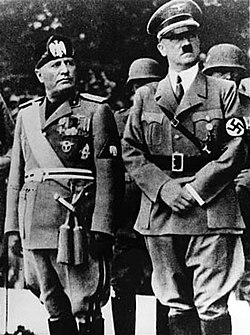 Mussolini became a close ally of German dictator Adolf Hitler, whom he influenced. Mussolini entered World War II in June, 1940 on the side of Nazi Germany. Three years later, the Allies invaded Italy. In April 1945 Mussolini attempted to escape to German-controlled Austria, only to be captured and shot near Lake Como by Communist Resistance units. Mussolini was born in the village of Dovia di Predappio in the province of Forlì, in Emilia-Romagna on July 29, 1883 to Rosa and Alessandro Mussolini. He was named Benito after Mexican reformist President Benito Juárez; the names Andrea and Amilcare were for Italian socialists Andrea Costa and Amilcare Cipriani. His mother, Rosa Maltoni, was a teacher. His father, Alessandro, was a blacksmith who often encouraged Benito to disobey authority (other than his own). He adored his father, but his love was never reciprocated. Like his father, who was a member of the first Socialist International, Benito became a socialist. He was not baptized as a child. By age eight, he was banned from his mother's church for pinching people in the pews and throwing stones at them outside after church. He was sent to boarding school later that year and at age 11 was expelled for stabbing a fellow student in the hand, throwing an inkpot at a teacher, and using a stick to poke out his classmate's eyes. He did, however, receive good grades, and qualified as an elementary schoolmaster in 1901. In 1902 he emigrated to Switzerland to escape military service. During a period when he was unable to find a permanent job there, he was arrested for vagrancy and jailed for one night. Later, after becoming involved in the socialist movement, he was deported and returned to Italy to do his military service. He returned to Switzerland immediately, and a second attempt to deport him was halted when Swiss socialist parliamentarians held an emergency debate to discuss his treatment. Subsequently, a job was found for him in the city of Trento, which was ethnically Italian but then under the control of Austria-Hungary, in February 1909. There, he did office work for the local socialist party and edited its newspaper L'Avvenire del Lavoratore ("The future of the worker"). It did not take him long to make contact with irredentist, socialist politician and journalist Cesare Battisti, and to agree to write for and edit the latter's newspaper Il Popolo ("The People") in addition to the work he did for the party. For Battisti's publication he wrote a novel, Claudia Particella, l'amante del cardinale, which was published serially in 1910. He was later to dismiss it as written merely to smear the religious authorities. The novel was subsequently translated into English as The Cardinal's Mistress. In 1915 he had a son from Ida Dalser, a woman born in Sopramonte, a village near Trento. By the time his novel hit the pages of Il Popolo, Mussolini was already back in Italy. His polemic style and growing defiance of Royal authority and, as hinted, anti-clericalism put him in trouble with the authorities until he was finally deported at the end of September. After his return to Italy (prompted by his mother's illness and death) he joined the staff of the "Central Organ of the Socialist Party", Avanti! ("Forward!"). Mussolini's brother, Arnaldo, would later become the editor of Il Popolo d'Italia, the official newspaper of Benito Mussolini's Fascist Party (November 1922). The term Fascism derives from the word "Fascio" which had existed in Italian politics for some time. A section of revolutionary syndicalists broke with the Socialists over the issue of Italy's entry into the First World War. The ambitious Mussolini quickly sided with them in 1914, when the war broke out. These syndicalists formed a group called Fasci d'azione rivoluzionaria internazionalista in October 1914. Massimo Rocca and Tulio Masotti asked Mussolini to settle the contradiction of his support for interventionism and still being the editor of Avanti! and an official party functionary in the Socialist Party. Two weeks later, he joined the Milan fascio. Mussolini claimed that it would help strengthen a relatively new nation (which had been united only in the 1860s in the Risorgimento), although some would say that he wished for a collapse of society that would bring him to power. Italy was a member of the Triple Alliance, thereby allied with Imperial Germany and Austria-Hungary. It did not join the war in 1914 but did in 1915 — as Mussolini wished — on the side of Britain and France. Called up for military service, Mussolini served at the front between September 1915 and February 1917. During that period he kept a war diary in which he prefigured himself as a charismatic hero leader of a socially conservative national warrior community. In reality, however, he spent most of the war in quiet sectors and saw very little action . It has always been thought that he was seriously wounded in grenade practice in 1917 and that this accounts for his return to Milan to the editorship of his paper. But recent research has shown that he in fact used what were only very minor injuries to cover the more serious affliction of neurosyphilis . Fascism became an organized political movement following a meeting in Milan on March 23, 1919 (Mussolini founded the Fasci di Combattimento on February 23, however). After failing in the 1919 elections, Mussolini at last entered parliament in 1921. The Fascisti formed armed squads of war veterans called squadristi to terrorize anarchists, socialists and communists. The government rarely interfered. In return for the support of a group of industrialists and agrarians, Mussolini gave his approval (often active) to strikebreaking, and he abandoned revolutionary agitation. When the liberal governments of Giovanni Giolitti, Ivanoe Bonomi, and Luigi Facta failed to stop the spread of chaos, and after Fascists had organized the demonstrative and threatening Marcia su Roma ("March on Rome") (October 28, 1922), Mussolini was invited by Vittorio Emanuele III to form a new government. At the age of 39, he became the youngest Premier in the history of Italy on October 31, 1922. Contrary to a common misconception, Mussolini did not become prime minister because of the March on Rome. King Victor Emmanuel III knew that if he did not choose a government under either the Fascist or Socialist party, Italy would soon be involved in a civil war. Accordingly, he asked Mussolini to become Prime Minister, obviating the need for the March on Rome. However, because fascists were already arriving from all around Italy, he decided to continue. In effect, the threatened seizure of power became nothing more than a victory parade. Mussolini's fascist state, established nearly a decade before Adolf Hitler's rise to power, would provide a model for Hitler's later economic and political policies. Both a movement and a historical phenomenon, Italian Fascism was, in many respects, an adverse reaction to both the perceived failure of laissez-faire economics and fear of international Bolshevism (a short-lived Soviet influence was established in Bavaria just about this time), although trends in intellectual history, such as the breakdown of positivism and the general fatalism of postwar Europe were also factors. Fascism was a product of a general feeling of anxiety and fear among the middle-class of postwar Italy, arising out of a convergence of interrelated economic, political, and cultural pressures. Italy had no long-term tradition of parliamentary compromise, and public discourse took on an inflammatory tone on all sides. Under the banner of this authoritarian and nationalist ideology, Mussolini was able to exploit fears in an era in which postwar depression, the rise of a more militant left, and a feeling of national shame and humiliation stemming from its 'mutilated victory' at the hands of the World War I peace treaties seemed to converge. Italian influence in the Aegean and abroad seemed impotent and disregarded by the greater powers, and Italy lacked colonies. Such unfulfilled nationalistic aspirations tainted the reputation of liberalism and constitutionalism among many sectors of the Italian population. In addition, such democratic institutions had never grown to become firmly rooted in the young nation-state. And as the same postwar depression heightened the allure of Marxism among an urban proletariat even more disenfranchised than their continental counterparts, fear regarding the growing strength of trade unionism, communism, and socialism proliferated among the elite and the middle class. In this fluid situation, Mussolini took advantage of the opportunity and, rapidly abandoning his early socialist and republican program, put himself at the service of the antisocialist cause. The fascist militias, supported by the wealthy classes and by a large part of the state apparatus which saw in him the restorer of order, launched a violent offensive against the syndicalists and all political parties of a socialist or Catholic inspiration, particularly in the north of Italy (Emilia Romagna, Toscana, etc. ), causing numerous victims though the substantial indifference of the forces of order. These acts of violence were, in large part, provoked by fascist squadristi who were increasingly and openly supported by Dino Grandi, the only real competitor to Mussolini for the leadership of the fascist party until the Congress of Rome in 1921. Mussolini had a gift for fiery rhetoric which contributed to his coming to power. The violence increased considerably from 1920 to 1922 until the March on Rome. Confronted by these badly armed and badly organized fascist militias attacking the Capital, King Victor Emmanuel III, preferring to avoid any spilling of blood, decided to appoint Mussolini, who at that moment had the support of about 22 deputies in Parliament, President of the Council. Victor Emmanuel continued to maintain control of the armed forces: if he had wanted to, he would have had no difficulties in booting Mussolini and the completely inferior fascist forces out of Rome. Therefore, it is not appropriate to refer to Mussolini's rise as a "coup d'état" since he obtained his post legally with the blessing of the monarch. As Prime Minister, the first years of Mussolini's reign were characterized by a coalition government composed of nationalists, liberals and populists and did not assume dictatorial connotations until the assassination of Matteotti. With the silencing of political dissent as the result of Matteotti's assassination, the function of Mussolini's government became comparable to that of authoritarian dictatorships. In domestic politics, Mussolini favoured the complete restoration of State authority, with the integration of the Fasci di Combattimento into the armed forces (the foundation in January 1923 of the Milizia Volontaria per la Sicurezza Nazionale) and the progressive identification of the Party with the State. In political and social economy, he produced legislation that favoured the wealthy industrial and agrarian classes (privatizations, liberalizations of rent laws and dismantlement of the unions). In June of 1923, a new majoritarian electoral law was approved which assigned two thirds of the seats in Parliament to the coalition which had obtained at least 25% of the votes. This law was punctually applied in the elections of April 6, 1924, in which the fascist "listone" obtained an extraordinary success, aided by the use of shenanigans, violence and intimidatory tactics against opponents. The assassination of the socialist deputy Giacomo Matteotti, who had requested the annulment of the elections because of the irregularities committed, provoked a momentary crisis of the Mussolini government. The response of the opposition was weak and generally unresponsive (the secession of the Aventine), incapable of transforming their posturing into a mass antifascist action, was not sufficient to distance the ruling classes and the Monarchy from Mussolini who, on 3 January 1925, broke open the floodgates and, in a famous discourse in which he took upon himself all of the responsibility for the squadrist violence (though he did not mention the assassination of Matteotti), proclaimed a de facto dictatorship, suppressing every residual liberty and completing the identification of the Fascist Party with the State. From late 1925 until the middle of the 1930s, fascism experienced little and isolated opposition, although that which it experienced was memorable, consisting in large part of communists such as Antonio Gramsci, socialists such as Pietro Nenni and liberals such as Piero Gobetti and Giovanni Amendola. While failing to outline a coherent program, fascism evolved into a new political and economic system that combined totalitarianism, nationalism, anti-communism and anti-liberalism in a state designed to bind all classes together under a corporatist system (The "Third Way"). This was a new system in which the state seized control of the organization of vital industries. Under the banners of nationalism and state power, Fascism seemed to synthesize the glorious Roman past with a futuristic utopia. Despite the themes of social and economic reform in the initial Fascist manifesto of June 1919, the movement came to be supported by sections of the middle class fearful of socialism and communism. Industrialists and landowners supported the movement as a defense against labour militancy. Under threat of a fascist March on Rome in October 1922, Mussolini assumed the premiership of a right-wing coalition Cabinet initially including members of the pro-church Partito Popolare (People's Party). From left: Chamberlain, Daladier, Hitler, Mussolini, and his son-in-law, Ciano after the Munich Conference, 1938. In the beginning Mussolini was given support from all political spectrums in Italy, from liberals to conservatives. Unbeknownst to them, he was dismantling parliament democratically with legislation that they had approved. By 1926 he had complete control over the Italian government and people. Skillfully using his secret police to intimidate his opponents into silence, and exercising his absolute control over the press, Mussolini gradually built up the legend of Il Duce. In 1925, he introduced the press laws which stated that all journalists must be registered fascists. However, not all newspapers were taken into public ownership and Corriere della Sera sold on average 10 times as many copies as the leading fascist newspaper 'Il Popolo D'Italia'. Nevertheless, Italy was soon a police state. The assassination of the prominent internationalist socialist Giacomo Matteotti in 1924, began a prolonged political crisis in Italy, which did not end until the beginning of 1925 when Mussolini asserted his personal authority over both country and party to establish a personal dictatorship. Mussolini's skill in propaganda was such that he had surprisingly little opposition to suppress. Nonetheless, he was "slightly wounded in the nose" when he was shot on 7 April 1926 by Violet Gibson, an Irish woman and sister of Baron Ashbourne. He also survived a failed assassination attempt in Rome by anarchist Gino Lucetti, and a planned attempt by American anarchist Michael Schirru, which ended with his capture and execution. Benito Mussolini, official portrait as Italian Prime Minister, 1923. At various times after 1922, Mussolini personally took over the ministries of the interior, of foreign affairs, of the colonies, of the corporations, of the armed services, and of public works. Sometimes he held as many as seven departments simultaneously, as well as the premiership. He was also head of the all-powerful Fascist Party (formed in 1921) and the armed local fascist militia, the MVSN, or "Blackshirts", that terrorized incipient resistances in the cities and provinces. He would later form an institutionalised militia that carried official state support, the OVRA. In this way he succeeded in keeping power in his own hands and preventing the emergence of any rival. During his 21-year rule, Mussolini launched several public construction programs and government initiatives throughout Italy to combat economic setbacks or unemployment levels. His earliest was Italy's equivalent of the Green Revolution, known as the "Battle for Grain", which saw the foundation of 5,000 new farms and five new agricultural towns on land reclaimed by draining the Pontine Marshes. This plan effectively increased Italy's agricultural output by more than 50% and solved a national food shortage through a wide-scale cultivation of grain. Mussolini also initiated the "Battle for Land", a policy based on land reclamation outlined in 1928. The initiative experienced mixed success - while projects such as the draining of the Pontine Marsh in 1935 for agriculture were good for propaganda purposes, provided work for the unemployed and allowed for great land owners to control subsidies - other areas in the Battle for Land were not very successful. This program was inconsistent with the Battle for Grain (small plots of land were inappropriately allocated for large-scale wheat production) and the Pontine Marsh was even lost during World War II. Fewer than 10,000 peasants resettled on the redistributed land and peasant poverty was still rife. In 1940, for instance, 90% of all Italian farmers owned 13% of farmland. The Battle for Land initiative was abandoned in 1940. He also combated an economic recession by introducing the "Gold for the Fatherland" initiative, by encouraging the public to voluntarily donate gold jewellery such as necklaces and wedding rings to government officials in exchange for steel armbands bearing the words "Gold for the Fatherland". The collected gold was then melted down and turned into gold bars, which were then distributed to the national banks. Efforts such as these gradually earned him the support and allegiance of people throughout Italy. Furthermore, he rebuilt the wealth and morale of the people, improved the national living standard, and gave Italy a highly-regarded diplomatic front in the courts of Europe. As dictator of Italy, Mussolini's foremost priority was the subjugation of the minds of the Italian people and using propaganda to do so; whether at home or abroad, and here his training as a journalist was invaluable. Press, radio, education, films — all were carefully supervised to manufacture the illusion that fascism was the doctrine of the 20th century, replacing liberalism and democracy. The principles of this doctrine were laid down in the article on fascism, written by Giovanni Gentile and signed by Mussolini that appeared in 1932 in the Enciclopedia Italiana. In 1929, a concordat with the Vatican was signed, the Lateran treaties, by which the Italian state was at last recognized by the Roman Catholic Church, and the independence of Vatican City was recognized by the Italian state. In 1927 Mussolini had himself baptized by a Roman Catholic priest in order to take away certain opposition from the side of Italy's Catholics, who were then still very critical of the modern Italian State, which had taken away papal property and virtually blackmailed several popes inside the Vatican. However, Mussolini never became known to be a practicing Catholic. Nevertheless, since 1927, and more even after 1929, Mussolini, with his anti-Communist doctrines, convinced many Catholics to actively support him. Under the dictatorship, the effectiveness of the parliamentary system was virtually abolished, though its forms were publicly preserved. The law codes were rewritten. All teachers in schools and universities had to swear an oath to defend the Fascist regime. Newspaper editors were all personally chosen by Mussolini himself, and no one who did not possess a certificate of approval from the Fascist party could practice journalism. These certificates were issued in secret, so the public had no idea of this ever occurring, thus skillfully creating the illusion of a "free press". The trade unions were also deprived of any independence and were integrated into what was called the "corporative" system. The aim (never completely achieved), inspired by medieval guilds, was to place all Italians in various professional organizations or "corporations", all of them under clandestine governmental control. Furthermore, that all schools, newspapers, etc. had to not write, for example, "the 13th of June 1933" but instead had to write "the 13th of June of the 11th year of Mussolini's power". Mussolini played up to his financial backers at first by transferring a number of industries from public to private ownership. But by the 1930s he had begun moving back to the opposite extreme of rigid governmental control of industry. A great deal of money was spent on highly visible public works, and on international prestige projects such as the SS Rex Blue Riband ocean liner and aeronautical achievements such as the world's fastest seaplane the Macchi M.C.72 and the transatlantic flying boat cruise of Italo Balbo, who was greeted with much fanfare in the United States when he landed in Chicago. Those projects earned respect from some countries, but the economy suffered from Mussolini's strenuous efforts to make Italy self-sufficient. A concentration on heavy industry proved problematic, perhaps because Italy lacked the basic resources. In foreign policy, Mussolini soon shifted from the pacifist anti-imperialism of his lead-up to power, to an extreme form of aggressive nationalism. An early example of this was his bombardment of Corfu in 1923. Soon after this he succeeded in setting up a puppet regime in Albania and in ruthlessly consolidating Italian power in Libya, which was loosely a colony since 1912. It was his dream to make the Mediterranean mare nostrum ("our sea" in Latin), and established a large naval base on the Greek Island of Leros to enforce a strategic hold on the Eastern Mediterranean. In 1935, at the Stresa Conference, he helped create an anti-Hitler front in order to defend the independence of Austria. But his successful war against Abyssinia (Ethiopia) in 1935 and 1936 was opposed by the League of Nations and this eventually led to Hitler seeking an alliance with Fascist Italy. The invasion of Ethiopia was accomplished rapidly (the proclamation of Empire took place in May of 1936) and involved several atrocities such as the use of chemical weapons, (mustard gas and phosgene) and the indiscriminate slaughter of much of the local population to prevent opposition. The armed forces disposed of a vast arsenal of grenades and bombs loaded with mustard gas which were dropped from airplanes. This substance was also sprayed directly from above like an "insecticide" on to enemy combatants and villages. It was Mussolini himself who authorized the use of the weapons: "Rome, 27 October '35. A.S.E. Graziani. The use of gas as an ultima ratio to overwhelm enemy resistance and in case of counterattack is authorized. Mussolini." "Rome, 28 December '35. A.S.E. Badoglio. Given the enemy system I have authorized V.E. the use even on a vast scale of any gas and flamethrowers. Mussolini." Mussolini and his generals sought to cloak the operations of chemical warfare in the utmost secrecy, but the crimes of the fascist army were revealed to the world through the denunciations of the International Red Cross and of many foreign observers. The Italian reaction to these revelations consisted in the "erroneous" bombardment (at least 19 times) of Red Cross tents posted in the areas of military encampment of the Ethiopian resistance. The orders imparted by Mussolini, with respect to the Ethiopian population, were very clear: "Rome, 5 June 1936. A.S.E. Graziani. All rebels taken prisoner must be killed. Mussolini." "Rome, 8 July 1936. A.S.E. Graziani. I have authorized once again V.E. to begin and systematically conduct a politics of terror and extermination of the rebels and the complicit population. Without the legge taglionis one cannot cure the infection in time. Await confirmation. Mussolini." The predominant part of the work of repression was carried out by Italians who, besides the bombs laced with mustard gas, instituted forced labor camps, installed public gallows, killed hostages, and mutilated the corpses of their enemies.Graziani ordered the elimination of captured guerrillas by way of throwing them out of airplanes in mid-flight. Many Italian troops had themselves photographed next to cadavers hanging from the gallows or hanging around chests full of decapitated heads. One episode in the Italian occupation of Ethiopia was the slaughter of Addis Ababa of February, 1937 which followed upon an attempt to assassinate Graziani. In the course of an official ceremony a bomb exploded next to the general. The response was immediate and cruel. The thirty or so Ethiopians present at the ceremony were impaled, and immediately after, the black shirts of the fascist Militias poured out into the streets of Addis Ababa where they tortured and killed all of the men, women and children that they encountered on their path. They also set fire to homes in order to prevent the inhabitants from leaving and organized the mass executions of groups of 50-100 people. His active intervention in 1936 - 1939 on the side of Franco in the Spanish Civil War ended any possibility of reconciliation with France and Britain. As a result, he had to accept the German annexation of Austria in 1938 and the dismemberment of Czechoslovakia in 1939. At the Munich Conference in September 1938 he posed as a moderate working for European peace. But his "axis" with Germany was confirmed when he made the "Pact of Steel" with Hitler in May 1939. Members of TIGR, a Slovene anti-fascist group, plotted to kill Mussolini in Kobarid in 1938, but their attempt was unsuccessful. The term "Axis Powers" was coined by Mussolini, in November 1936, when he spoke of a Rome-Berlin axis in reference to the treaty of friendship signed between Italy and Germany on October 25, 1936. His "Axis" with Germany was confirmed when he made another treaty with Germany in May 1939. Mussolini described the relationship with Germany as a "Pact of Steel", something he had earlier referred to as a "Pact of Blood". Clearly the subordinate partner, Mussolini followed the Nazis and adopted racial policies that led to persecution of the Jews and the creation of apartheid in the Italian empire. Before this, Jews were not specifically persecuted by Mussolini's government, and were permitted to be high members of the fascist party. Mussolini did not approve of all of Hitler's policies. In fact, most historians believe Mussolini's Race Laws, enacted in 1938 and often left unenforced, were more a move to appease Hitler than anything else. Like many Italians, who were known for their cosmopolitan culture, tolerance and "easy-goingness", Mussolini seemed mostly indifferent to race, believing that anyone could be a good Italian if they did what they were told. In fact, he once jokingly remarked that if Hitler's racial theories were to be taken seriously, then the "...eskimos should be considered the highest form of life on Earth....". In April, 1938, Mussolini privately suggested that the Vatican consider excommunicating Adolf Hitler. To this day, it is unknown whether the Catholic Church considered excommunicating Hitler a plausible decision. As World War II (WWII) approached, Mussolini announced his intention of annexing Malta, Corsica, and Tunis. He spoke of creating a "New Roman Empire" that would stretch east to Palestine and south through Libya and Egypt to Kenya. In April 1939, after a brief war, he annexed Albania. Mussolini decided to remain 'non-belligerent' in the larger conflict until he was quite certain which side would win. On June 10, 1940 Mussolini finally declared war on Britain and France. On October 28, 1940, Mussolini attacked Greece. But after initial success, the Italians were repelled by a relentless Greek counterattack which resulted in the loss of ¼ of Albania, until Hitler was forced to assist him by attacking Greece as well. In June 1941, Mussolini declared war on the Soviet Union and in December also declared war on the United States. In 1943, following the Axis defeat in North Africa, setbacks on the Eastern Front and the Anglo-American landing in Sicily, most of Mussolini's colleagues (including Count Galeazzo Ciano, the foreign minister and Mussolini's son-in-law) turned against him at a meeting of the Fascist Grand Council on July 25, 1943. King Vittorio Emanuele III called Mussolini to his palace and stripped the dictator of his power. Upon leaving the palace, Mussolini was swiftly arrested. He was then sent to Gran Sasso, a mountain resort in central Italy (Abruzzo), in complete isolation. Hitler and Mussolini parade through the streets of Vienna after the successful Anschluss of Austria. Mussolini was replaced by the Maresciallo d'Italia Pietro Badoglio, who immediately declared in a famous speech "La guerra continua a fianco dell'alleato germanico" ("The war continues at the side of our Germanic allies"), but was instead working to negotiate a surrender; 45 days later (September 8) Badoglio would sign an armistice with Allied troops. Badoglio and the King, fearing the German retaliation, fled from Rome, leaving the entire Italian Army without orders. Many units simply disbanded, some reached the Allied-controlled zone and surrendered, a few decided to start a partisan war against the Nazis, and a few rejected the switch of sides and remained allied with the Germans. Rescued a few days later in a spectacular raid planned by General Kurt Student and carried out by Otto Skorzeny, Mussolini set up the Italian Social Republic, a fascist state (RSI, Repubblica Sociale Italiana) in northern Italy. He lived in Gargnano during this period, but was little more than a puppet under the protection of his liberators. In this "Republic of Salò", Mussolini returned to his earlier ideas of socialism and collectivization. He also executed some of the fascist leaders who had abandoned him, including his son-in-law, Galeazzo Ciano. During this period he wrote his memoirs, and along with his autobiographical writings of 1928, would be combined and published by Da Capo Press as My Rise and Fall. Benito Mussolini, Claretta Petacci and other Fascists hung by their feet after being executed. On April 27, 1945, in the afternoon, near the village of Dongo (Lake Como), just before the Allied armies reached Milan, as they headed for Chiavenna to board a plane to escape to Austria, Mussolini and his mistress Clara Petacci were caught by Italian communist partisans. After several unsuccessful attempts to take them to Como they were brought to Mezzegra. They spent their last night in the house of the De Maria family. The day after, April 28, Mussolini and his mistress were both shot, along with their fifteen-man train, mostly ministers and officials of the Italian Social Republic. The executions took place in the small village of Giulino di Mezzegra, and, at least according to the official version of events, were conducted by "Colonnello Valerio" (Walter Audisio), the communist partisan commander after being given the order to kill Mussolini, by the National Liberation Committee. However, a witness, Bruno Giovanni Lonati - another partisan in the Socialist-Communist Garibaldi brigades though not a Communist - abruptly confessed in the 1990s to have killed Mussolini and Claretta with an Italian-English officer from the British secret services, called 'John'. Lonati's version has never been confirmed, but neither has it been debunked; a polygraph test on Lonati proved inconclusive. On April 29 the bodies of Mussolini and his mistress were found hung upside down on meat hooks in Piazzale Loreto (Milan), along with those of other fascists, to show the population the dictator was dead. This was both to discourage any fascists to continue the fight and an act of revenge for the hanging of many partisans in the same place by Axis authorities. The corpse of the deposed leader became subject to ridicule and abuse by many who felt oppressed by the former dictator's policies. Mussolini was survived by his wife, Donna Rachele Mussolini, by two sons, Vittorio and Romano Mussolini, and his daughters Edda, the widow of Count Ciano and Anna Maria. A third son, Bruno, had been killed in an air accident while flying a P108 bomber on a test mission, on 7 August 1941. Mussolini's granddaughter Alessandra Mussolini, daughter of Romano Mussolini, is currently a member of the European Parliament for the neo-fascist party Alternativa Sociale; other relatives of Edda (Castrianni) moved to England after the Second World War. The fascist ideology Mussolini espoused in his lifetime is still popular in some quarters in modern-day Italy. Mussolini was a major character in Inferno by Larry Niven and Jerry Pournelle, where he acted as guide to the protagonist during his journey through Hell. The last few days of Mussolini's life have been depicted in Carlo Lizzani's movie Mussolini: Ultimo atto (Mussolini: The last act, 1974). On a popular animation website Newgrounds, a video included Mussolini as a villain who was part of the mob who killed Chuck Norris in a flash animation entitled Ultimate Showdown which gained a massive cult following in late 2005. Mussolini is spoofed in Charlie Chaplin's The Great Dictator where he is named Benzino Napaloni, dictator of Bacteria and is portrayed by Jack Oakie. An animated clay Mussolini fights and is defeated by Roberto Benigni in a Celebrity Deathmatch episode. ^ Manhattan, Avro (1949). “Chapter 9: Italy, the Vatican and Fascism”, The Vatican in World Politics. Retrieved on 2006-06-28. ^ ^ Paul O'Brien (2005). Mussolini in the First World War. The Journalist, the Soldier, the Fascist. Berg, Oxford and NY. ^ Paul O'Brien (Italia Contemporanea, March 2002, pp. 5-29). Al capezzale di Mussolini. Ferite e malattie 1917-1945. ^ Dictatorship (from Benito Mussolini). Encyclopedia Britannica. Retrieved on 2006-10-30. ^ Giorgio Candeloro (1981). Storia dell'Italia Moderna. Feltrinelli. ^ “Mateotti, Giacomo”, The Columbia Encyclopedia, Sixth Edition. Retrieved on 2006-06-29. ^ Angelo Del Bocca and Giorgio Rohat (1996). I gas di Mussolini. Editori Riuniti. ISBN=8835940915. The Birth of Fascist Ideology, From Cultural Rebellion to Political Revolution, Zeev Sternhell, with Mario Sznajder and Maia Asheri, trans. by David Maisel, Princeton University Press, NJ, 1994. pg 214. Mussolini, Renzo De Felice, Torino : Einaudi, 1995. Mussolini: A New Life, Nicholas Farrell, London: Phoenix Press, 2003. Mussolini: The Last 600 Days of Il Duce, Ray Moseley, Dallas: Taylor Trade Publishing, 2004. O'Brien, Paul. Mussolini in the First World War: The Journalist, the Soldier, the Fascist. Oxford: Berg Publishers, 2004 (hardback, ISBN 1-84520-051-9; (paperback, ISBN 1-84520-052-7). Mastering Modern World History by Norman Lowe "Italy, 1918-1945: the first appearance of fascism. Giovanni Hus (Jan Hus), il veridico Rome (1913) Published in America under John Hus (New York: Albert and Charles Boni, 1929) Republished by the Italian Book Co., NY (1939) under John Hus, the Veracious. There is an essay on "The Doctrine of Fascism" credited to Benito Mussolini but ghost written by Giovanni Gentile that appeared in the 1932 edition of the Enciclopedia Italiana, and excerpts can be read at Doctrine of Fascism. There are also links to the complete text.